Five years ago I made this fun box for some of our best friends. A wedding shower was to be thrown for them and, as a surprise, best wishes from their family and friends near and far were sent in the form of cards, photos, and artwork. I constructed a tray with multiple compartments that were sized to fit common envelope sizes. 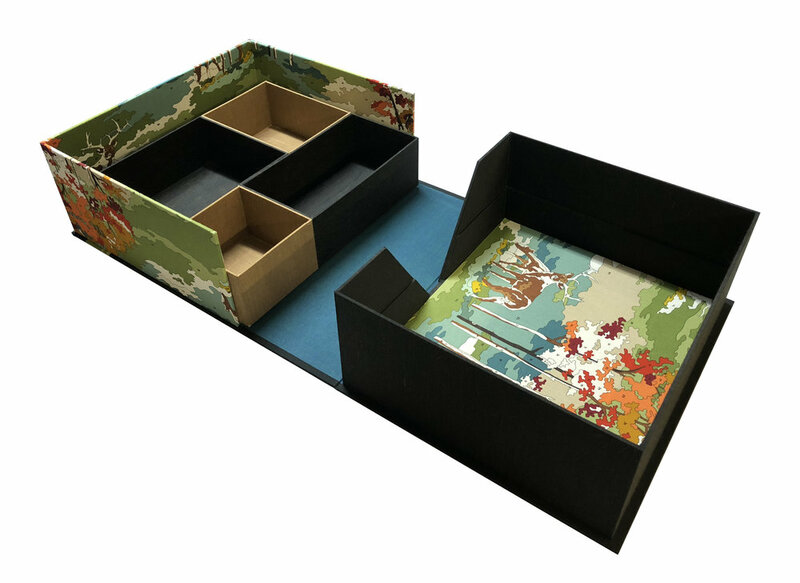 That tray nestled onto the inner ridges of a clamshell box which left about an inch and a half space for larger papers to be stored beneath. I was enamored with the concept and made one for a client to give as a wedding gift, and then consulted with two other friends to see if they would like to have them as gifts for their special occasions. The box above was made as a baby keepsake box, and the box below was made in celebration of a wedding. My sweet and gracious friends patiently waited for their boxes, because, as it is with the cobbler’s children having no shoes, oftentimes the box maker’s friends have no boxes. That is, until now! The recipient of the baby box showed such faith that I would get the box to her, that she kept her keepsakes in an Amazon box until mine made it to her door. And, when I wrote to let my other friend know that her wedding box was on its way, I learned that she had just arrived home with her new baby daughter and the box will get there just in time to catch her first keepsakes. I made these bags so that we can be a little more eco-friendly with gift wrapping at our house without loosing the charm of the usual wrapping options. I wanted them to be completely reversible so that they can be used at Christmastime and throughout the year. I looked around and found the perfect tutorial, How to Make a Storage Bag Any Size, on YouTube by Laura Ann Coia of SewVeryEasy. These gifs reveal the reverse of each bag. Both sides use the same set of drawstrings, the knot just pops right through from one side to the other. I had fun choosing fabrics and ribbon that I already had on hand. The tree on the bag on the right is from a sweet holiday pattern from Hunter’s Design Studio. We celebrated our 10th wedding anniversary by taking a couple days to breathe in the fresh air at Muir beach. It was so relaxing to listen to the water and watch it carve its way through the sand. We especially enjoyed combing the beach for its treasures. All One Ocean has one of their beach clean up stations at Muir Beach. It provides repurposed collection bags along with a reminder of our impact on the planet and the importance of caring for our oceans. It’s a marvel how, although in different ways, it can be as rewarding to hunt for trash as it is to hunt for beautiful shells and sea glass. Here are some samples from a recent foil stamping class. Can you see that tiny turkey graphic? It was getting close to Thanksgiving. In this 3 hour class, students learn how to use a Kwikprint hot stamping machine (the out of focus piece of equipment in the photo) and get to practice their technique on bookcloth, leather, stickers, and different thicknesses of paper. Starting in 2019, SFCB will offer a full day class which will go into the finer details of stamping. If you’d like to see a Kwikprint in action, check out this great video by Mark Andersson, my bookbinding instructor. There is a treasure trove of type drawers at SFCB available for use with their four Kwikprints. Every time I have taught this short class I discover new typefaces and am delighted when students come up with fun combinations I haven’t seen before. Several years ago I wrote a blog post about my modest-in-comparison collection of metal type that I use with the Kwikprint in my studio. I have since added spacers to my collection, but otherwise I’m still using the same type and it has served me well. This is my class model from the most recent limp paper binding class that I taught at San Francisco Center for the Book as part of their Bookbinding Core Certificate Program. The limp paper binding is the third structure that students undertake. It is an elegant structure and no adhesives are needed to hold it all together. In this picture you can see a hint of the tabs that seem to magically hold those turn-ins down. The turn-ins are the parts of the cover that fold over to the inside of the book. The material used for the cover is a gorgeous heavy weight Cave paper that is handmade in Minnesota. In this color the texture stands out especially nicely. It reminds me of wool and is nearly as soft. That extra bend at the foredge (side opposite the spine of the book) is one of my favorite bits of bookbinding trivia. It is called a Yapp, so named for the 19th century publisher who popularized the style of a portion of the cover bent down over the edge of the textblock. The original Yapp style would have had a bend on all three edges, but that would inhibit this book from resting comfortably upright on a bookshelf. Here is a super speedy version of the sewing demo that I made for my students to refer to after they learn this binding. This library in a box caught my eye while my mom and I were touring the light-keeper's house on Tybee Island in Georgia earlier this month. The library (The Columbia City Carnegie in Seattle) was our second home when I was growing up, so it warmed my heart to know that even though the families that lived in the home were isolated, some of them were able to have the company of good books whenever they pleased.